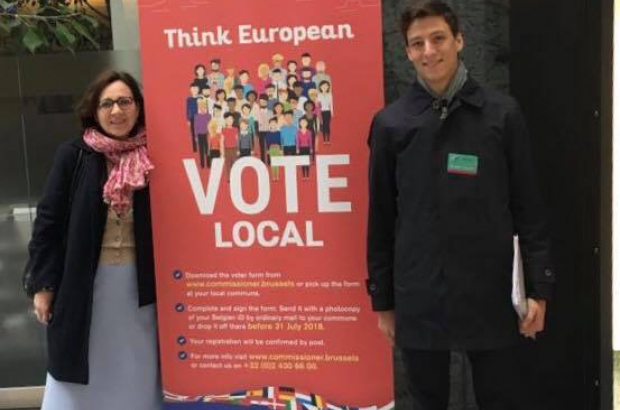 Less than one in 10 foreigners in Brussels who are eligible to vote in this October's local elections have registered to do so, new figures reveal. With less than three months to go before the 31 July deadline to join the electoral roll, research by Vote Brussels shows only 9% of EU citizens and 6% of eligible non-EU citizens have registered. The figure is similar to the same period before the 2012 local elections. Foreigners make up a third of the potential electorate in Brussels. There are about 300,000 non-Belgians who are entitled to vote in their commune's elections on 14 October. About three quarters are EU citizens, and the other quarter are non-EU citizens who have lived here for at least five years. Saint-Gilles is the Brussels municipality with the highest percentage of foreigners - 48%. There, 13.9% of non-Belgians have registered to vote. In Ixelles, where 46% of residents are not Belgian, the registration rate is just 7%. The lowest turnout so far is in Brussels-City itself, where just 6.5% of eligible foreign voters have registered. The regional average is 8.6%. A Bulletin survey in collaboration with Vote Brussels last month showed a lack of information was one of the main reasons why so few foreigners had joined the electoral register, with most unaware that they can register by post and de-register whenever they wish. The Brussels Commissioner website has all the details. "Despite non-Belgians' interest in the elections, few articles have been published outside the English-language expat press," Vote Brussels noted in its latest research. However, it noted: "Some communes have made efforts to inform their non-Belgian residents with updated web pages, brochures, events and multilingual letters with free return envelopes to post the registration form." Can I assume that once someone registers, voting becomes obligatory and fines will be imposed if a person decides not to vote in any subsequent election? Why register to vote? Aren't we already registered with the commune (although EU citizens)? Too much bureaucracy, nope, I won't take.